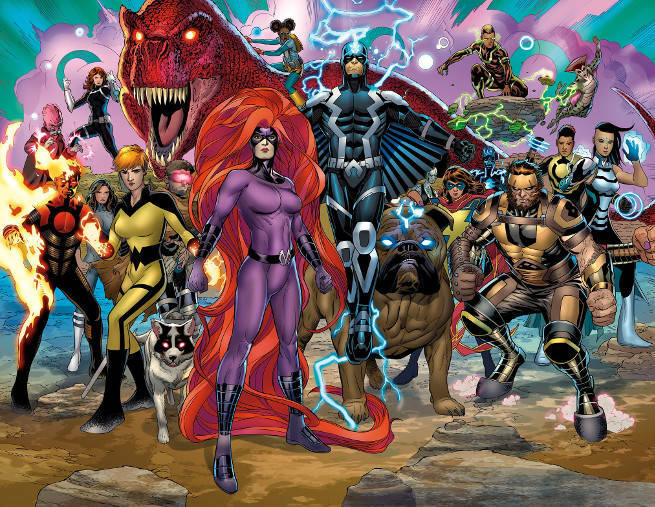 Marvel Comics is on the cusp of beginning a brand new era for the Inhumans and the X-Men. Marvel's ResurrXion relaunch will see a new line of comics for each Marvel franchise, and it all begins this week. ResurrXion provides a perfect starting point for new readers looking to get on board with either the X-Men or the Inhumans. ComicBook.com is here to provide readers with everything they need to know about the new ResurrXion series. In this article we'll be covering the new Inhumans line. ResurrXion brings three new Inhumans series: Royals, Black Bolt, and Secret Warriors. Wondering which ones to you might enjoy reading? Keep reading through the slides and we'll tell you everything you need to know before heading to your local comic book store! The ResurrXion of the Inhumans kicks off in this week's Inhumans Prime, which serves as a kind of introduction to the current world and status quo of the Inhumans. It is written by Al Ewing with art by Ryan Sook, and is a great place to start if you're a new reader. To catch you up on recent Inhumans history: To defend his people, the Inhuman king Black Bolt set off a Terrigen bomb that release Terrigen Mist, the substance catalyzes Terrigenesis in Inhumans, which activates their abilities, into Earth's atmosphere. Since then, the every time one of the Terrigen clouds passes over a populated area, som new Inhumans, sometimes referred to as Nuhumans, are activated. Some of these Nuhumans include popular characters like Ms. Marvel, Moon Girl, and Mosaic. In order to better serve her people, Queen Medusa, who now rules in her husband's absence, moved the seat of Inhuman power to New Attilan, a city built in the Hudson River. Eventually it was discovered thatTerrigen Mist is toxic to mutants and infected them with a disease dubbed M-Pox. Most mutants left Earth and sought sanctuary with the X-Men in the plane of Limbo, but Beast established a lab in New Attilan to study the mists and the pox in hopes of finding a solution. Instead, Beast discovered that Terrigen was so thuroughly saturating Earth's atmosphere that the planet would soon become entirely uninhabitable for mutants. Fearing the worst, the X-Men attacked New Attilan and attempted to destroy the Terrigen Mist. The Inhumans resisted but once Medusa learned why the mutatns attacked she destroyed the Terrigen Mist herself. Now, without any Terrigen left in existenc, the current Inhuman generation looks to be the last. Medusa has stepped down as Queen and reunited with Black Bolt, but the future for their people seems bleak. 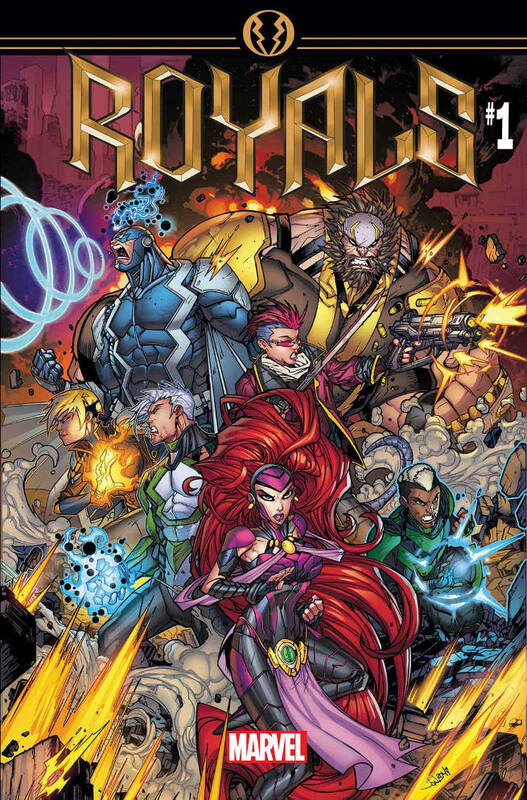 The first Inhumans ResurrXion title announced by Marvel was Royals. As the title suggests, Al Ewing and Jonboy Meyers' series will focus on the Inhuman king and Queen, Black Bolt and Medusa, joined by Gorgon, Flint, and Swain. 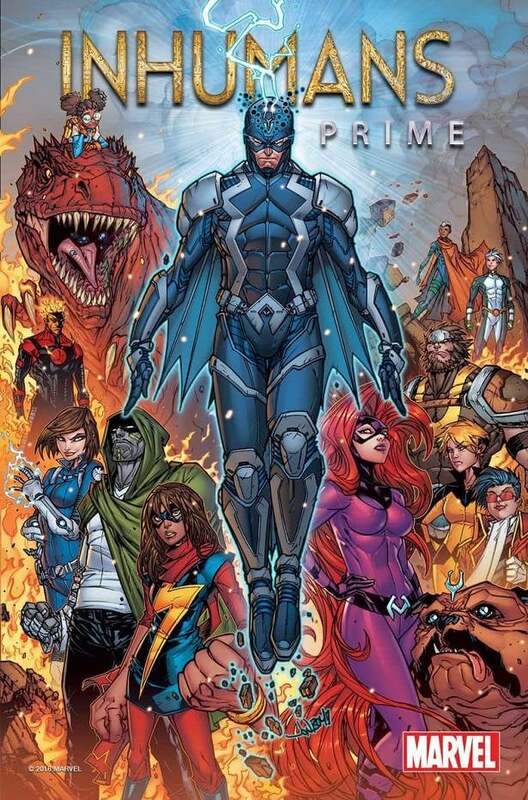 The premise of the book is that Marvel Boy, a Kree warrior from another dimension, may have information that could create new Terrigen or otherwise reignite the Inhumans' ability to undergo Terrigenesis. In order to find the secrets of Terrigenesis, the Royals will have to venture into outer space. What they'll find there remains a mystery. Recommendation: If you only read one Inhumans title, this should probably be it. Seems like a good fit for old school Inhumans fans, new readers, and anyone who is a fan of Al Ewing's other Marvel work. ResurrXion brings with it the first ever solo ongoing series for the Inhuman king, Black Bolt. The new series is written by novelist Saladin Ahmed with art by Christian Ward and puts Black Bolt in the unusual position of being jailed in a prison for the galaxy's worst criminals. The mystery of how Black Bolt ended up imprison will unfold over the course of the series, and Black Bolt will be forced to face down or make alliances with some scary fellow inmates, including the Absorbing man. 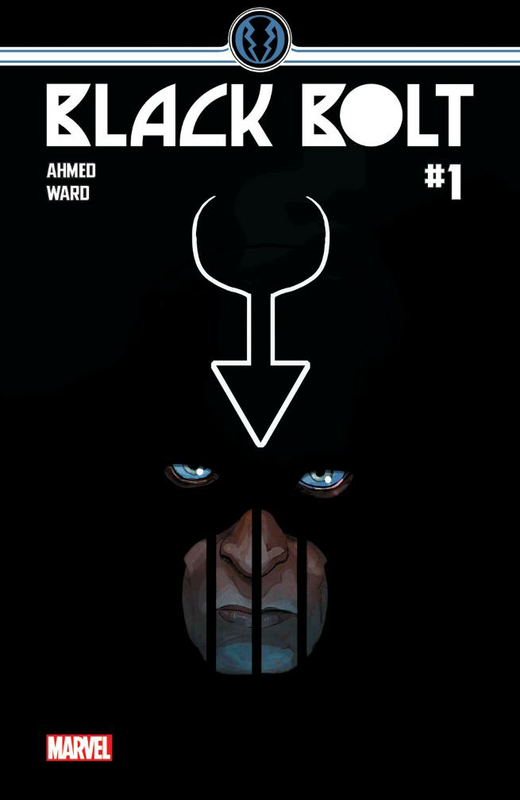 Recommendation: Read Black Bolt if you prefer your comics to be continuity light, if you enjoy Marvel's more inventive and novelistic solo series (Vision, Karnak, Moon Knight), or if you're a fan of Ahmed's Throne of the Crescent Moon. The relaunch of Secret Warriors is the only ResurrXion title tied into the events of Marvel's next big event, Secret Empire. 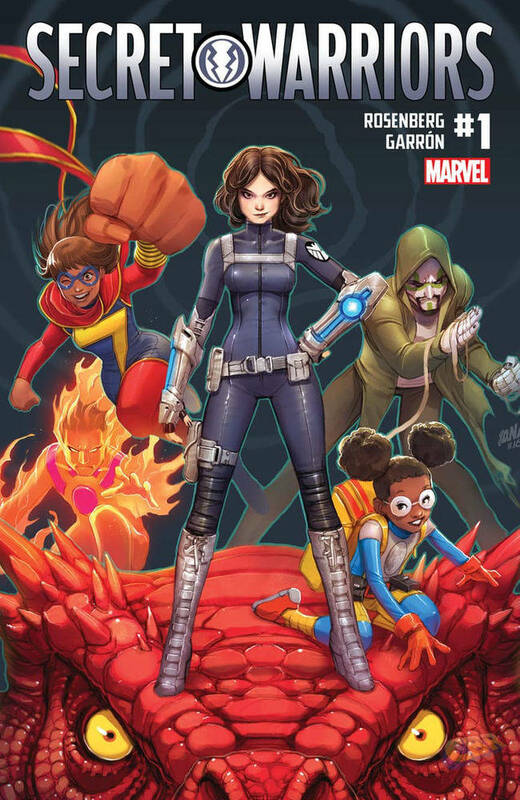 Just like the original Secret Warriors, the new series from writer Matthew Rosenberg and artist Javier Garron once again sees Daisy "Quake" Johnson leading a talented team against Hydra. The difference is that this time the team is all Inhumans and that Hydra is being led by Captain America. The idea of turning the Secret Warriors into an Inhumans strike force was originally used in Marvel's Agents of SHIELD, however, the Marvel Comics version of the concept features some much more recognizable characters: Ms. Marvel, Moon Girl and Devil Dinosaur, Karnak, and Inferno. Recommendation: Anyone who enjoys Agents of SHIELD, either the TV show or the comic, and wants to see more of Daisy leading the Inhumans should check this out. This is also good for anyone who wants to see Inhumans being superheroes, is a fan of any of the Secret Warriors' solo series, is excited about Secret Empire, or is looking for a way into the larger continuity of the Marvel Universe. Background reading: The original Secret Warriors, Agents of SHIELD, Ms. Marvel, Devil Dinosaur, Karnak, Inhuman.